What do you do? (work, school, etc. ): I am a Social Media Manager and Strategist for several brands. I own my own company. I'm also a momager to Charlie and Sawyer. Dogs' names: Charlie and Sawyer, females. Both of my dogs are rescues. It was important to me to help a dog in need and save a life. Even though there are millions of dogs who need homes, I am allergic to dogs and require a hypoallergenic breed. Those can take a long time to find in a shelter or from a rescue organization since they are more in demand these days. I searched for a dog in 2012 not long after my previous dog had passed away. I found Charlie on Petfinder and she had come out of a bad situation involving a puppy mill in Indiana. I actually drove there overnight to save her and bring her back to NY. A few years later, I decided I wanted a second dog (and a bestie for Charlie) so I went on the hunt again. I reached out to a rescue organization in California where my mom had adopted her dog that year, and told them I was looking for a hypoallergenic dog. A few months later, they contacted me about a puppy who had been re-homed twice and was looking for a forever home. After seeing her photo and hearing that she was unwanted, I was immediately in love. Now the two of them are inseparable and never leave each other's side. I can't imagine only having one dog now! I've had dogs my entire life and have never not lived with a dog. I come from a family of animal lovers and it rubbed off on me. I think it makes you more adventurous and spontaneous. My dogs have changed my life because of the people they have introduced me to, the places they have brought me to and the experiences they have opened me up to. Their Instagram platform has allowed me to let my freak flag fly and be the crazy dog lady that I always have been. How do/did you deal with having a dogs in your twenties, may it be now or previously? Dogs are great for pushing you to be more social. I go to a lot of events, outings and activities that include dogs and meet a lot of interesting and adventurous people. Sometimes it's difficult, such as when you want to travel or when you have to plan life events around them, because their care and well being always comes first when you have to plan something. Also, the financial aspect plays a big part in it, because most people in their twenties can hardly afford rent and bills, let alone added vet bills and dog food. It can be tough. What is/was your daily routine? Typically, the dogs and I get up around 6 and go for a long walk or to the park across the street for a run. 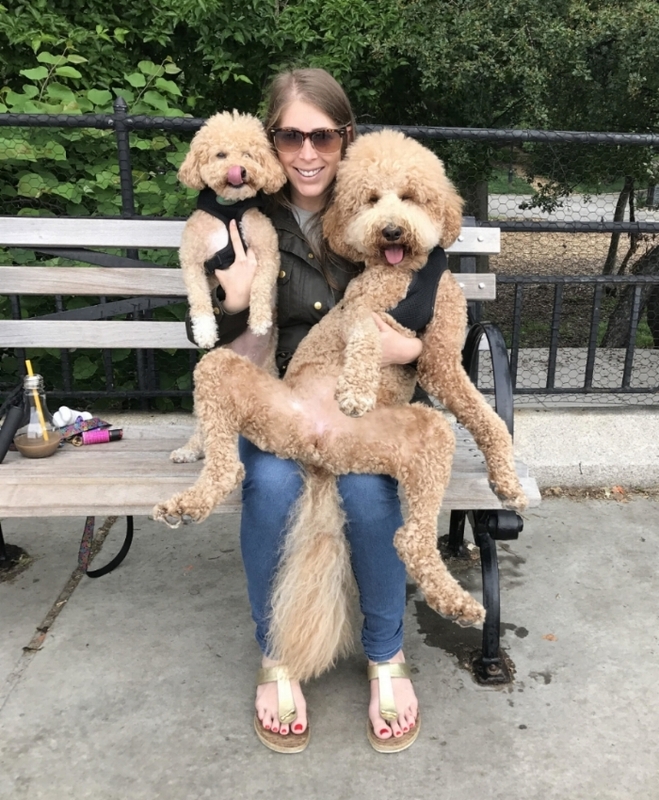 On weekends we love to go to Central Park for off-leash time and coffee, where we often see a lot of our friends with their dogs. It's always difficult when your dog gets sick or has something happen to them. They are my children. I feel hurt when they are hurt. It can definitely be difficult to handle sometimes. Unique characteristics about your dogs? They are the friendliest and most loving dogs I've ever seen. They are very aware of the dogs who are in their "inner circle" of friends because they definitely play with them in a more enthusiastic way than dogs they don't know. What are some of your favorite things to do with your dogs? Hike, Travel, go to Central Park, paddle board, swim, go to bars/rooftops, explore a new town or city. They come everywhere with me. Does anyone help you take care of your dogs while at work or school? I typically work from home, but when I am not home during the day, I have a dog walker. When I travel, my Mom usually babysits them and they love spending time at her house.